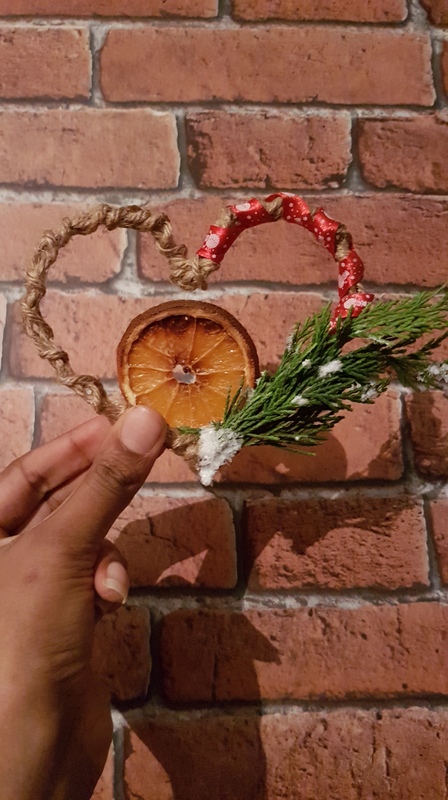 This Christmas I have had to find some creative ways to make everything special, different and personal. 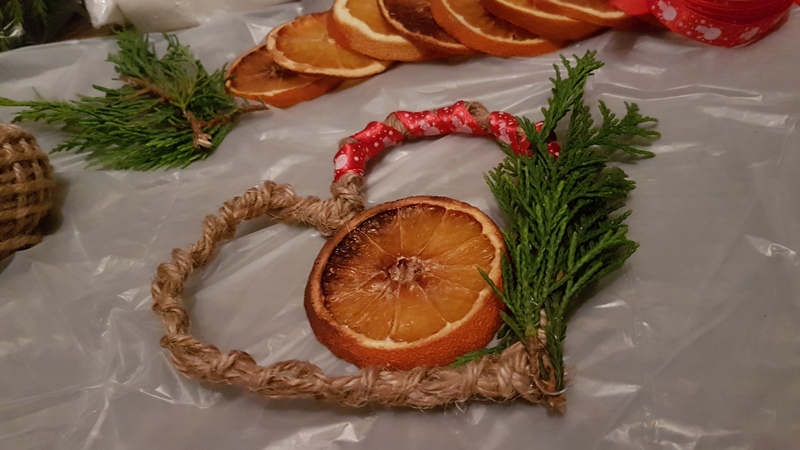 Homemade Christmas is the way to go. Orange is the star of the show due to having a few pieces after home drying a couple to make decorations. Below I’ll go through step by step what I did to make some of the decorations from bits I had around the house and garden. 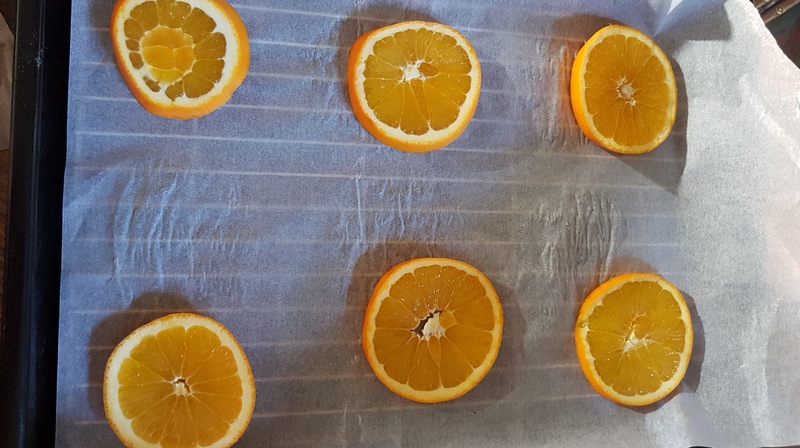 First let’s begin with how I dried the Oranges. There may be other ways to do it but this is what I did. First preheat the oven at the highest temperature for about 15 minutes. 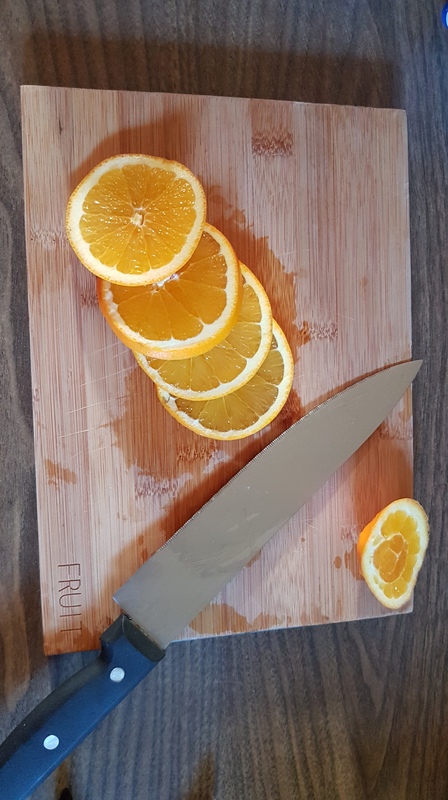 Cut the oranges into thin slices not too thin or they make break part. 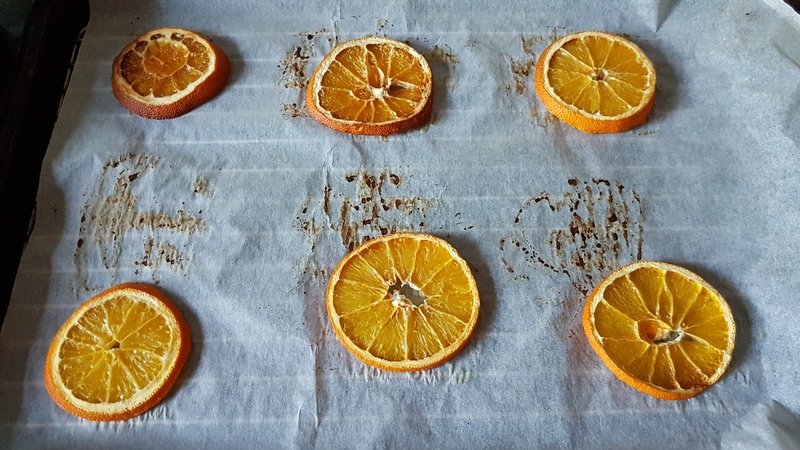 Cut a piece of baking paper the same size of the baking tray and place the Orange slices on the paper with spaces between. 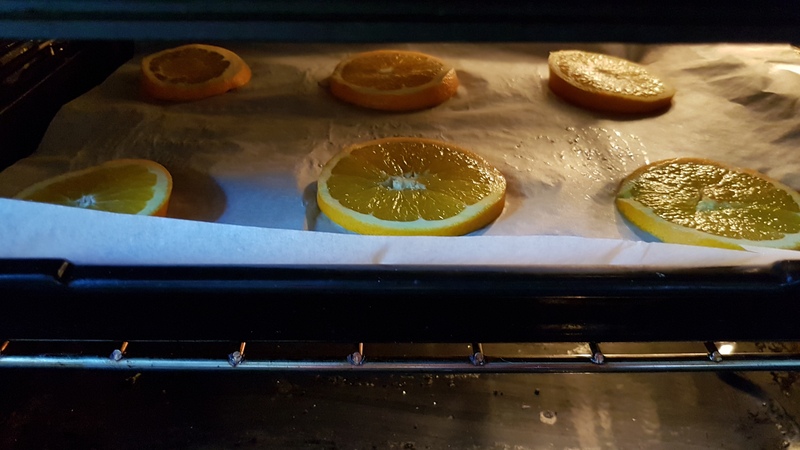 Turn the oven down to its lowest setting and put the oranges in for about 2.5 hours. After 2.5 hours the slices should be shrunken a little, dried out and deeper in colour. I put the oranges back in the oven but with the heat turned off. If you wanted to make them even more festive you could perforate them with cloves and star anise. 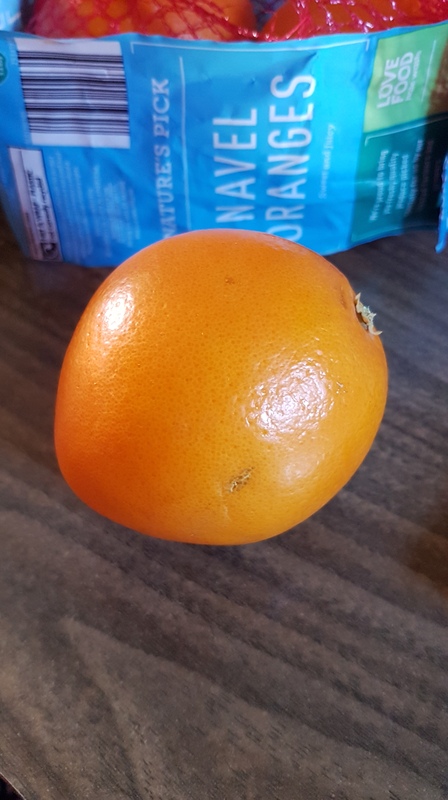 I didn’t have any in the house or and whole cinnamon which would also go really well with the oranges. Luckily what I was wrapping was square so it was rather easy to do. Wrap your present in the wrap trying to fold in corners and edges so it has a clean finish use the sellotape to secure. With the ribbon let it out so you have enough to wrap around the present with a little to spare (you can trim later if you need to). Place the present on the ribbon mid way then bring the two ends together twist over once as if doing shoe laces. Tie around the other side and tie a knot to keep it secure. If you have tags great! But I unfortunately didn’t so made some out of card and patterned paper. I sprayed one side of the card and stuck the paper to it. Let it dry then traced around a small lid I had as it was rectangular with curved corners. Cut out the rectangles and punched a hole in one of the corners. Cut a piece of ribbon long enough to thread through the hole and loop back on itself then glue the ends together. 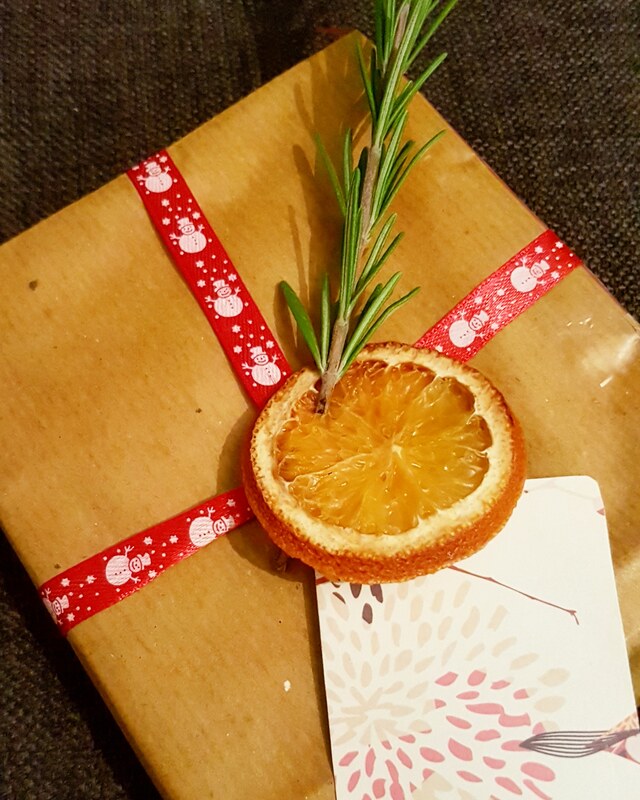 Take the Orange slice and poke the Rosemary through it. 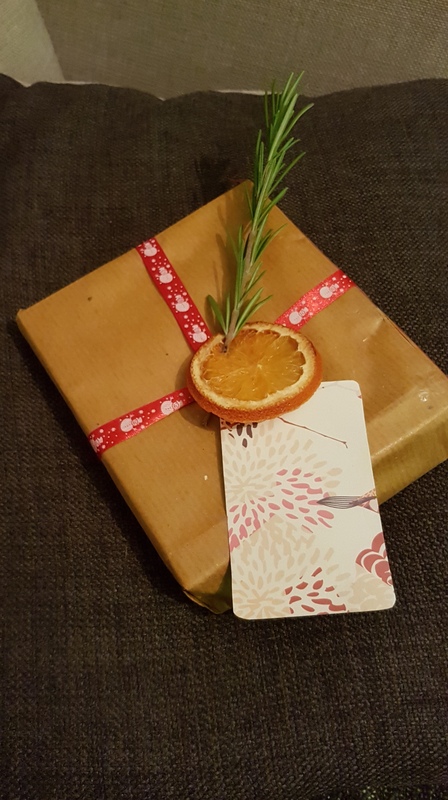 Tie the end of the Rosemary and the tag with a piece of string hidden behind the Orange and that’s it a beautifully simple wrapped gift. I must confess I do have a craft box and have a tendency to horde wrapping paper from gifts I’ve received or to save flattened boxes because I may need it for a craft project at some point so I may have things in there just in case. Apologies for the lack of pictures I was making this up as I went along. Draw a ring on the cardboard. I did this by drawing around two lids one smaller than the other, smallest in the middle largest on the outside. 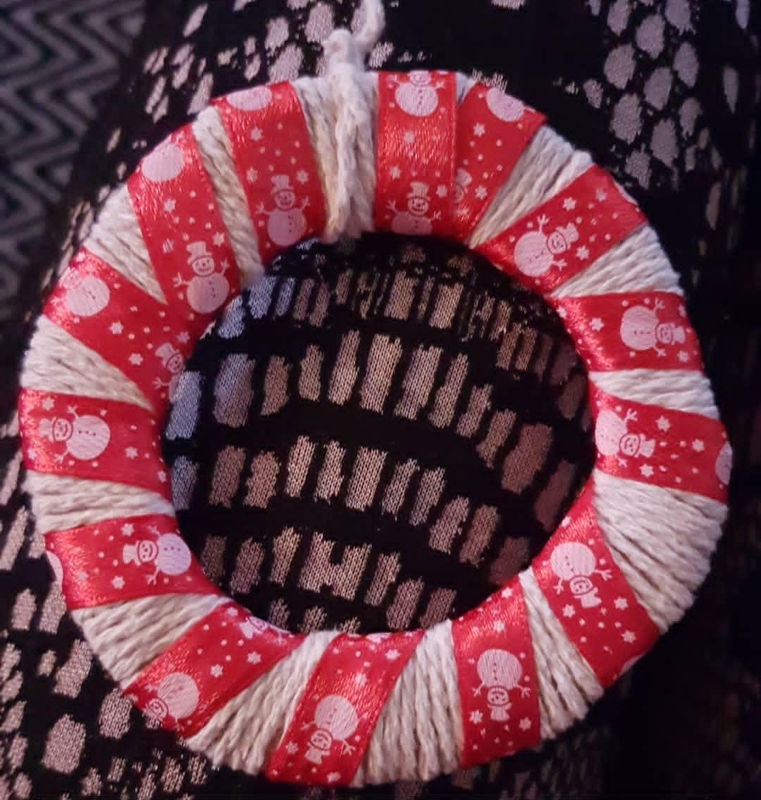 Cut out the ring then wrap the string around it leaving a stray bit of string at the beginning so you can tie the ends together at the end. Get the ribbon and glue one end to the top of the ring where the knot is. 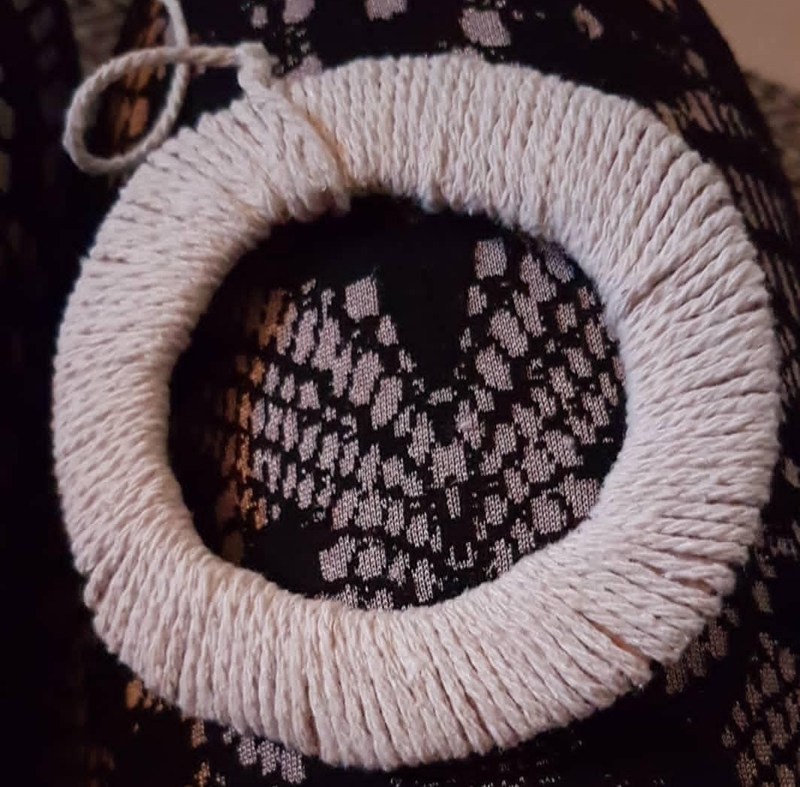 Then wrap around the ring ensuring to leave gaps to show the string off. Once you get back to the top but the ribbon and glue down. I made a bow from the ribbon by shaping it until I was happy then glueing it into place. Due to lack of bells I sewed some sequins onto the middle of the bow. 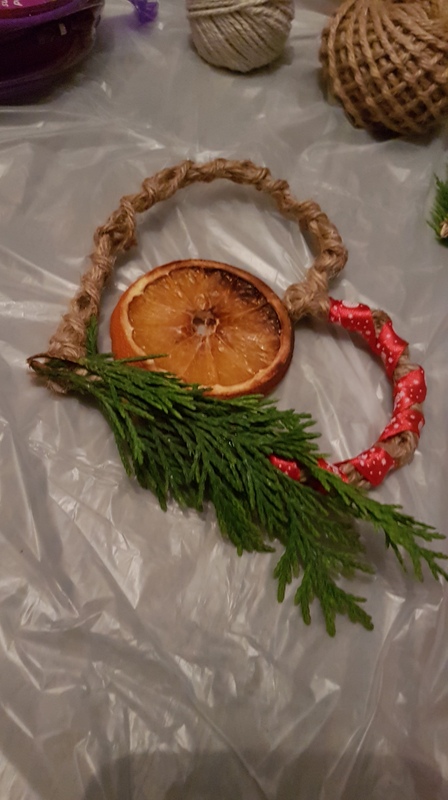 Using clear string I hung the orange in the middle of the wreath from the knotted end. This could be used as a hanging decoration but I’m going to be using it for decorating gifts. This would have been a lot easier if I could find my wire but i couldnt so I had to get inventive. Start by drawing a heart on the wood or cupboard depending on what you go for. I went for cardboard as I didn’t have wood. 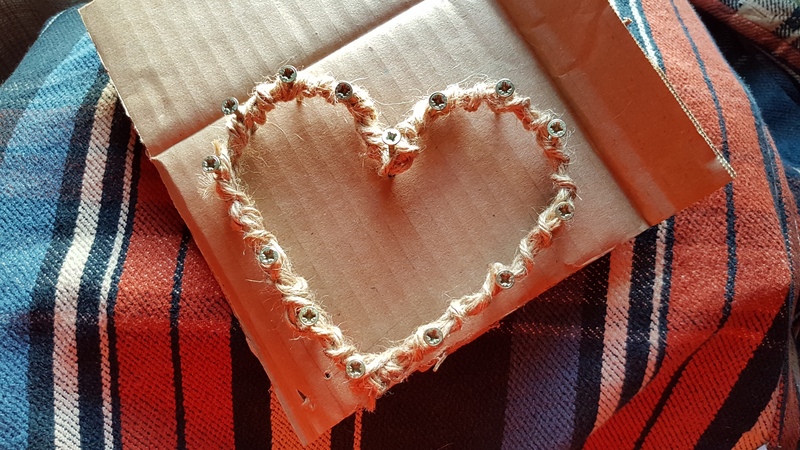 Take the nails or screws and put them into the cardboard along the outline of the heart but not all the way, you’ll need the length of the nail/screw for the next bit. 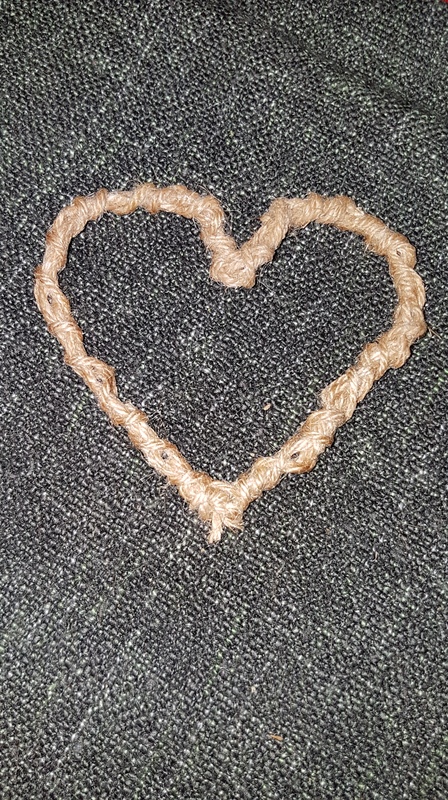 Weave the string in and out of the nails/screws starting from the bottoms of the heart, when you get back to the start tie a knot in the string. 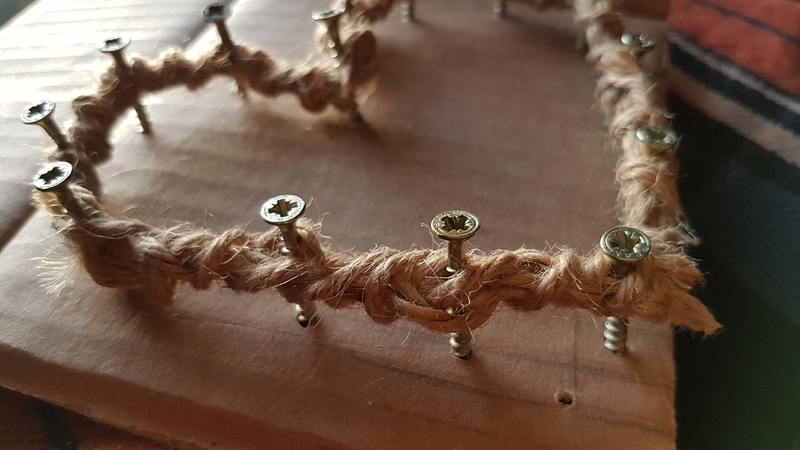 Now weave string in and out of the nails/screws but the opposite way. Repeat a few more times. Once happy with the thickness paint with glue and leave to dry, don’t worry it will dry clear. This took a couple of hours when I did it. Remove the heart from the nails/screws. I unscrewed the screws from the cardboard individually. Thread a needle with the clear string and anchor it to the bottom of the heart. 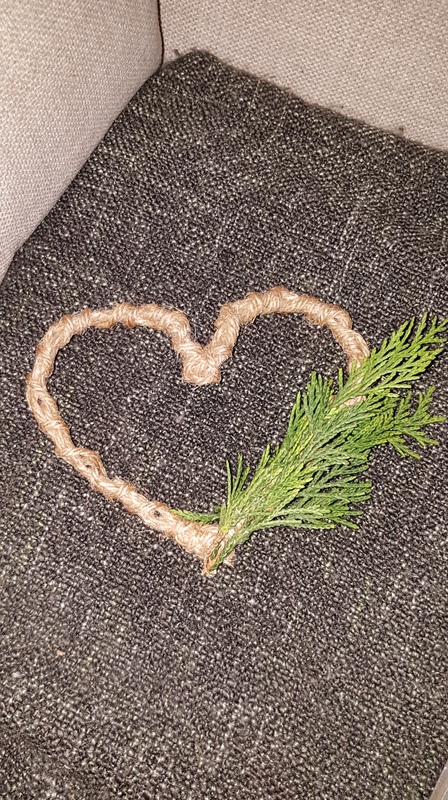 Attach the conifer cuttings to the heart with small loops to reduce the viability of the see through string. 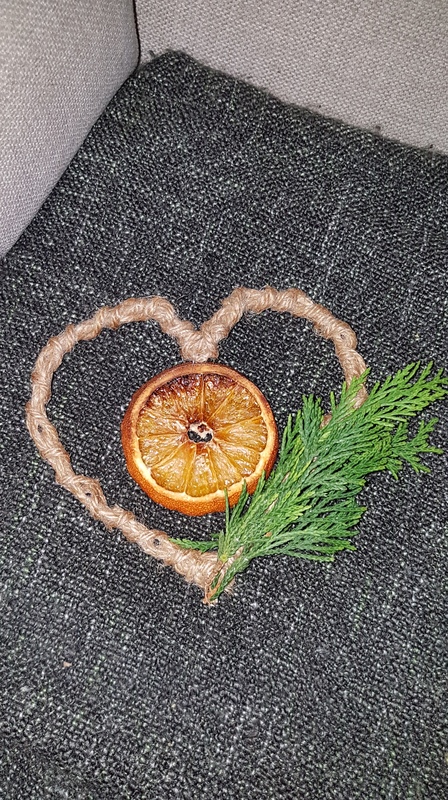 Attach the Orange slice with the clear to the V of the heart. 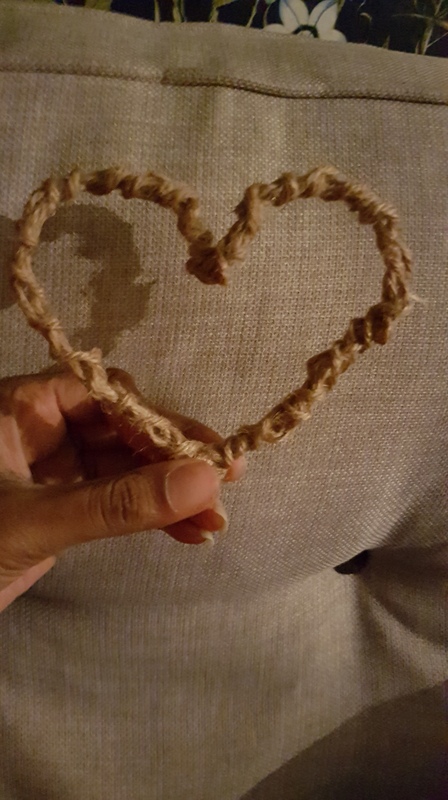 Wrap the ribbon around part of the heart ensuring to glue down the ends. You can leave your mini wreath as is or you can add fake snow. Get the PVA glue and dab it over the leaves. Sprinkle the fake snow over it. Shake over the excess. 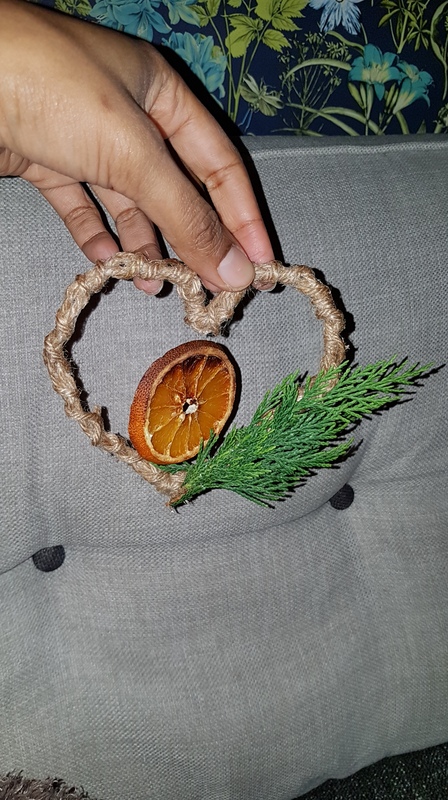 I made these wreaths on the fly with baby in arms but I’m sure if I had time and space to concentrate on them soley they would be even better. 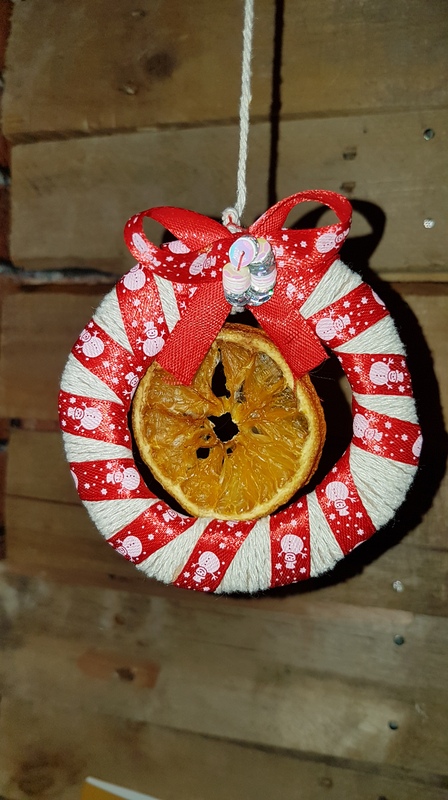 I happy with the results and will be making more festive decorations to don the presents I’m yet to wrap.